Alone in the un Hunted and desperate. To ask other readers questions about Defy the Fates, please sign up. Jessica H I'm so excited! More people need to know about this series it is amazing!! I need more info on this now! I thought was just a duology BUT THERE'S MORE???? Defy the Fates was perfect, perfect, perfect. My local Barnes and Noble placed this out on the shelves early - nice. What I didn't like would probably be a better way to frame this review. - How easily everythin My local Barnes and Noble placed this out on the shelves early - nice. While I enjoyed the series on a whole, and I understand it is YA (and that Claudia Gray is really one of the best SciFi writers for YA's out there), I still think it wasn't as strong as the other two books in the series. Maybe there will be a return to the world in the future? Maybe there won't be. All I know is that it's over and now I have to find another series that features a robot coming to terms with humanity and falling in love. I loved being back in this world but so sad that it is over! I'm so very needy for this one. I want it come to an exciting, soaring end. Post Reading This is a hard one to rate because I loved everything except for the last three chapters. The last three chapters are important. Prereading When you want a book so badly you keep coming back to check the release date as if it will somehow change if you keep looking at it. Hint: it doesn't. I read this in ONE DAY. And I suffered through the worst traffic to get it the day it was released. I LOVE THIS SERIES!!!!! I'm not ready . . . but I am at the same time! Defy the Stars and Defy the Worlds had me hooked, then they tore me apart, built me up, tore me apart AGAIN, built me up AGAIN, and then both of their endings tore me to SHREDS. I loved it. I hated it. But above all I loved them both, and now I'm both dying for and slightly dreading this one, because it is literally everything going against them (more-or-less), them trying to save themselves, and both about to probably go through some MAJOR changes (e I'm not ready . . . but I am at the same time! I loved it. I hated it. But above all I loved them both, and now I'm both dying for and slightly dreading this one, because it is literally everything going against them (more-or-less), them trying to save themselves, and both about to probably go through some MAJOR changes (especially Noemi and I HOPE TO LIGHT NOT ABEL). Light, I'm anxious and wanting, and every time I come back I'm secretly hoping the release date has hopped forward, even though I know better because it won't. I just . . . just . . . UGH. ANYWAY it’s almost April if we just casually overlook March and I AM SCARED AND NERVOUS FOR THIS BOOK. A nail biting ending of an incredible trilogy. Defy the Fates has stood up to its story, name and imagination it brings forwards. The shock with which we ended up in the previous part is retained for few chapters where we do not know how things will turn out to be. I gotta say that Abel surpasses every single criteria for a human, a hero. He is loving, determined, invincible to an extent, kind, emotional and even funny. He is everything a person could hope for put together in a wonderful package A nail biting ending of an incredible trilogy. Defy the Fates has stood up to its story, name and imagination it brings forwards. The shock with which we ended up in the previous part is retained for few chapters where we do not know how things will turn out to be. I gotta say that Abel surpasses every single criteria for a human, a hero. He is loving, determined, invincible to an extent, kind, emotional and even funny. He is everything a person could hope for put together in a wonderful package. His determination in saving Noemi and his love for her is pure and warms us. At the same time he does not leaves anybody who needed help in danger- his friends, Vagabond fleets and the selfish planets even. He really steals everybody's heart whenever he realizes his feelings for Noemi and sorry for what his creator had become and could have been. Noemi on the other hand survives and her step back to life again with lots of consequences that was not possible before. No matter what she became and where she comes from she is still the same- A loyal soldier, ardent friend and lover who never leaves anyone behind and a determined savior and a longing wanderer. The conversation between Abel and Noemi tells us all about how they have evolved as something more than a mech and human. The other characters also endears us like Virginia who wish never to get on her wrong side, wary of Shearer and her craziness, angry at the council of Genesis. And God, we finally get to see the craziest Burton Mansfield. More than these Defy the Fates stands best for moments- when Noemi and Abel kiss for the first time, when Noemi comes back and tries to understand herself, Abel willing to sacrifice for Noemi, entry and departure from the Damocles, Abel's change with Robin and as a tether and finally the consciousness fight itself. I loved the first two books of this series, but this one is definitely the best. It goes in so many directions, all of them right and well done, that you have to go with them. 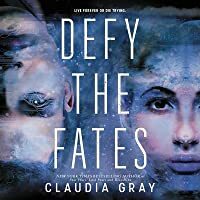 In a YA book I usually see the plot developing from a mile away, but in this book Claudia Gray manages to deal with possibilities in such a way that I was completely in the story. Just that is a feat in itself. Great series. I highly recommend. More a 4,5 ⭐️. Oh my. I can't believe it's over. I'm relieved in a way, because this frantic "running around the galaxy and running into more problems" thing was a little exhausting. I really enjoyed following Abe and Noemi's adventures and I'll miss them. i literally could not have asked for a better ending. can i please give more than five stars? 4.5 stars. It would have been 5 but... something big I was expecting didnt happen and WHY NOT. Ugh. While nothing will match the first book, Defy the Fates comes extremely close. Ive never seen so much tension, so much desperation, so many warring factions fight to survive. Noemi's ressurection, was so detailed it made my stomach churn. Claudia Gray perfectly described what it would be like to come back to life. In our world of tv or movies, when someone comes back from the brink of death, they're up and ready to go in a few minutes. But reality is very different. Noemi struggled, she didnt have the most basic motor funcions. She couldnt speak, or get a thought straight. She fell off the godamn medical table trying to stand up. She had just been brought back to life in a foriegn body, not her own, and Claudia Gray SHOWED that. Forward fast a few chapters, and Abel is fighting for his life, literrally. Remedy, The Consortium, Sherear, Genesis, EVERYONE wants a piece of the galaxy's most advanced mech. Although admittedly, the first two only wanted him because of promises/threats made by the last two. Genesis threated to end the allience for the Consortium, Sherear would refuse to hand out Cobweb cures for Remedy. I was frustrated on Able's behalf, as he was pulled back and forth like a bone between rabid dogs. Of course, Sherear does succeed in the end, and Able's soul is removed from his body. This however, is where Claudia Gray surprises me. I expect the age-old tale of "i know your in there, fight it!" and "so and so is alive in there, i know it!" But thats not how things go down, and im so pleasently surprised to be proven wrong. Able's soul endures, and he becomes a sort of omniscent presence, finding various machines to survive in. Like hes traveling across an invisible plane, accessible only to machines. At one point, he mind melds with Noemi, since she is part machine now, and the level of intimacy they experience is beautiful. Among past novels ive read, the closest comparison to this level of mind melding I can think of is the mental connection Eragon and Saphira possess in the Inheritance Cycle. But whereas thier bond is platonic, Abel and Noemi's is not. Finally, Abel seizes a window of opportunity to return to his body, and you can see why the book is called Defy the Fates. He is locked in a psychic battle with Mansfield, while a physical one rages around him. Mansfield is no pushover, and almost wins, but Able prevails in the end. I do feel a little bitter about Mansfield died though, or rather how his sould faded, since his actual body was dead. I felt like there shouldve been some sort or reconciliation, but in the end, he died as he lived. A sad old man with a god complex, afraid of death, and desperate to achieve immortality. All in all, this book was amazing, and a truly perfect ending to the trilogy. While it is not as good as the first, it definitely triumphs over the second. First things first, if you haven't read Defy The Stars, you need to go treat yourself to it ASAP. I received the book in a subscription box and for some reason or other, I didn't bother to read it for a year - I finally decided I needed to actually read the books I got in boxes otherwise what was the point of buying them, and OHMYGOD, it was life-changing. It's one of my favorite books of all time and most frequently recommended, mainly because I lament how underappreciat Crossposted at my blog. First things first, if you haven't read Defy The Stars, you need to go treat yourself to it ASAP. I received the book in a subscription box and for some reason or other, I didn't bother to read it for a year - I finally decided I needed to actually read the books I got in boxes otherwise what was the point of buying them, and OHMYGOD, it was life-changing. It's one of my favorite books of all time and most frequently recommended, mainly because I lament how underappreciated this series is. 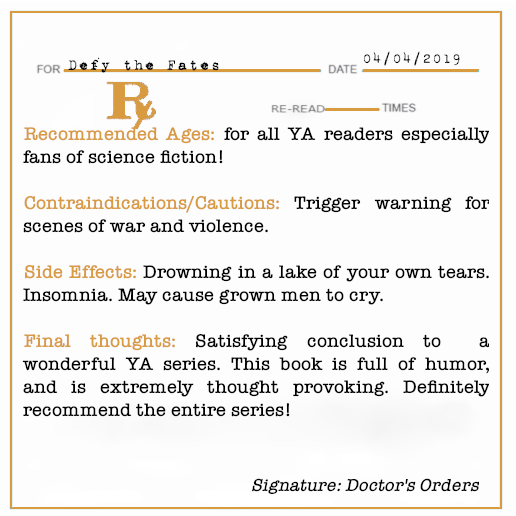 But if you haven't come across it before, you're in luck as you can now binge-read the whole trilogy in one hit instead of angsting for months til the sequel comes out like I have! If you have read the previous books, then the main question would be - does the conclusion to the series wrap up well and do justice to our beloved characters? And my answer is a fervent whole-hearted YES. I had my concerns going in - after the devastating cliffhanger that book 2 ended on, how would Noemi and Abel relate to each other in the aftermath of his highly unorthodox and frankly outrageous solution to saving her life? I was afraid that they would be at odds over it and that manufactured conflict would keep them apart, and now I see how foolish I was because Claudia Gray has never been cliche or taken the easy route in the past, and of course she wouldn't at this late stage in the game. There was a lot of heart-ache and struggle on Noemi's part to reconcile herself to this new life as a mech-human hybrid and certainly it DID cause tension between her and Abel, but not because of his choices when it came to keeping her alive. I love that she didn't blame him for what he did to her (personally I might've had a few words about playing God), but Noemi's difficulty in adapting to her new body and Abel's uncertainty over whether she blamed him took its toll on their relationship. Normally I don't like couples fighting because so often it's over something that could be easily resolved if they just TALKED like mature adults or contrived for plot reasons, but any conflict in this series has always been from believable character-drive reasons. (like being soldiers on opposing sides of a war ;) ) And the best part about this OTP is that they prioritize the well-being of others first and foremost, so any personal issues take a back-seat when it comes to saving the day, I love how noble and heroic they are. <3 Even if it distresses me how willing they are to sacrifice themselves at the drop of a hat! Moving on from our main duo, I'm glad to see that Virginia plays a big role in this book, she's a stealth MVP and a major highlight for me! The network of supporting characters built up in the previous two books comes to fruition here with a bigger cast in play, all with competing goals and political agendas and ulterior motives. I'm a little stunned at how effortlessly all the pieces come together and little tidbits or minor character dynamics set up earlier on are paid off, though not always as expected. At times it feels a bit like 'Noemi & Abel's Great Hits' tour as they swing by all the planets and run into old friends, old foes and everyone in between, but it all makes sense in the grand scheme of things. Even if it is a bit too neat and by design at times, I appreciate how well-planned this series was from the start and that the author had such a clear goal of how to develop the characters and where their journey was taking them. Of course it wasn't that clear to the audience - this book had so many blindsides and my head felt like it was about to explode from shock a few times! On each occasion a bombshell dropped, I couldn't imagine where the story could go from there or how our heroes could possibly adjust course to face the new challenge, but the story continued seamlessly every time and I wound up marveling again at how tightly plotted this trilogy is, especially with some of the foreshadowing laying the groundwork in earlier books. I feel on the whole that this book is practically perfect and it delivered on pretty much every level that I desired. My only criticism is that it was a bit too short and so the pacing was break-neck and didn't allow time for our main pairing to just breathe in between crises. My main investment was in their relationship and it felt as though they were continually being torn apart just as they had been reunited. I would've loved for a longer epilogue to really satisfy fans of their romance, but that's me being greedy, I'm just happy that it finished on such a perfect note. Brief summary of the end of Defy the Worlds: Noemi and Abel have brought an army of Vagabonds to the Genesis system, and have helped to forge an alliance that will hopefully lead to the end of the Liberty War. Earth launched an attack on Genesis and the Genesis army and the vagabonds started to fight back. Abel used his abilities as a mech to hack into the fighter mechs attacking Genesis and rendered them unable to fight, thereby basically guaranteeing Genesis’ victory against Earth. After the victory Darius Akide, arrives on the Persephone, and attempts to kidnap Abel and force him to seal the gate between Genesis and Earth; an act that will cause Abel’s destruction. Noemi arrived on the Persephone in time to see Darius Akide standing over Abel’s body, she attempts to stop him and Darius shoots her in the abdomen at point blank range. Abel becomes conscious and in a rage over Noemi’s death kills Darius. He then decides to do anything necessary to save Noemi, including taking her back to Haven and fixing her with mech parts- even though the price will probably be his soul. Summary of Defy the Fates: Abel has placed Noemi in a life support pod, in order to preserve her until he can save her life. He plans to take her to Gillian Shearer, on Haven, as she has a laboratory containing everything he needs. He is willing to barter his life to save Noemi, as the Gillian will want Abel’s body as payment for Noemi’s life. Upon awakening Noemi discovers that she is no longer completely human, but neither is she completely mech; she is something new. She also realizes that Abel has sacrificed himself for her, but she cannot sit back and let him die. The two of them have to fight for not only their lives but also for their right to be free, in this epic conclusion to the Constellation trilogy. This book did feel a little choppy to me while reading it. It felt like the characters were doing things just to do them, and I couldn’t see what the author intended with some of the scenes. However, it all makes sense in the end. Every scene and encounter has a purpose, and it all comes together in an epic finale. The only real complaint I have is that I wish the Epilogue was longer. I don’t need a Cassandra Claire epilogue that is 1/3 of the whole novel or a Sarah J Maas “novella” to sum up this book (I say this with great love and affection for both of these authors), but I honestly felt a little cheated of how little time we get to spend with the characters at the end of the series. After three books I have devoted a significant amount of emotional energy into these characters and I wish there was more pay off. That being said, I still love the series and this book and I would still read the whole thing over again if I had the chance. Teens and young adults of all ages and older, especially those looking for a great Scifi read. Trigger warning for scenes of war, that might be disturbing for some readers. Probably will cause grown men to cry- my husband has yet to finish it, but he is a big softy so I’m just assuming he will. Claudia Gray has written a wonderful finale to her Constellation trilogy. It is just as compelling as the first two and wraps up the storyline in a satisfying way. This whole series would be great for a book club, as there is plenty of discussion worthy topics. I personally would love to talk to someone who has also read these books, because I have a lot of feelings, so leave a comment if you want to discuss! Well, that was incredibly disappointing. Last year, I went on a Claudia Gray reading binge after reading the first book in the Constellation series, Defy the Stars. While her Firebird trilogy never reached peak awesomeness for me, it was still very enjoyable, and I read all three in a row. Unfortunately, Defy the Fates also lacks any real substance, but unlike the Firebird trilogy, it also just wasn't that enjoyable. In all honesty, I don't even know what the actual plot of this book was. It seeme Well, that was incredibly disappointing. In all honesty, I don't even know what the actual plot of this book was. It seemed like Noemi and Abel just sort of flitted around the galaxy, avoiding (entirely too many) conflicts too easily. At the midpoint, I looked up from the book to realize that we had circled back to the VERY FIRST conflict yet again, and there had been 0 development in either plot or character. My understanding is this series was supposed to be a duology, but it ended up being stretched into a trilogy. It shows. There just really wasn't enough story for 3 books. If books 2 and 3 had been condensed into a single, streamlined volume, the series as a whole would have been much stronger. 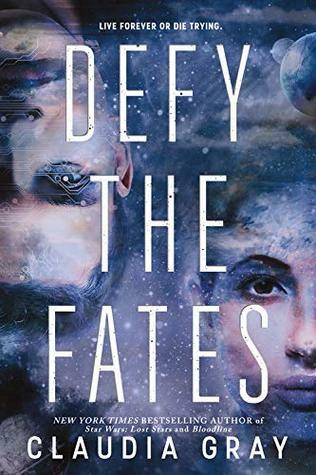 I gobbled this up right away, and there was something just less exciting about Defy the Fates than Defy the Stars and Defy the Worlds (both books I love and gave 5 stars to). It felt like the plot ran out on this one and there was just a lot of filler to keep Noemi and Abel apart (fake drama?) until the action at the end? I listened to this on audiobook, just like I did books 1 & 2 (the voice actors were the same, and it should have sounded the same), but book 3 was definitely less exciting f I gobbled this up right away, and there was something just less exciting about Defy the Fates than Defy the Stars and Defy the Worlds (both books I love and gave 5 stars to). It felt like the plot ran out on this one and there was just a lot of filler to keep Noemi and Abel apart (fake drama?) until the action at the end? I listened to this on audiobook, just like I did books 1 & 2 (the voice actors were the same, and it should have sounded the same), but book 3 was definitely less exciting for some reason. I'm so happy the series has a happy ending, but I'm overall pretty disappointed in this book. This books had so many near death moments, that I believed everyone would die at the end. I loved these series very much, they’re so well written, and to see Abel grow in unexpected ways, it feels like watching a child grow up. Claudia really outstretched herself with this one! If I had had more time I would’ve read it in one sitting! What a terrific conclusion to this young adult trilogy! At heart, this is a love story. Abel the mech loves Noemi the human soldier. Each wants to save/protect the other. Each has life-threatening enemies but they have a number of loyal friends as well! I really enjoyed this space opera coming-of-age tale and would highly recommend it to both teens and anyone who just enjoys good SF! I'm only giving this book four stars because I felt like at times the story was rushed. This book was smaller than the other books in the series and for the wrap up book, it really needed 100 more pages. Don't get me wrong, I still liked the story and I had no issue with the conclusion, just at times things got glossed over. Overall, I just really wish this book was longer. This review has been hidden because it contains spoilers. To view it, click here. It's all a bit too easy in this one, but... I still loved it. I care about Abel and Noemi a lot more than about most other characters. I missed references to Mech children and would have liked to hear a bit more about Gillian in the end. Absolutely thrilling ending to the trilogy Of Able and Neomi’s crazy life. Thankfully the ending was a good one that I won’t spoil for you all. I almost want to reread the entire series again together.